Yahoo. It is fall! 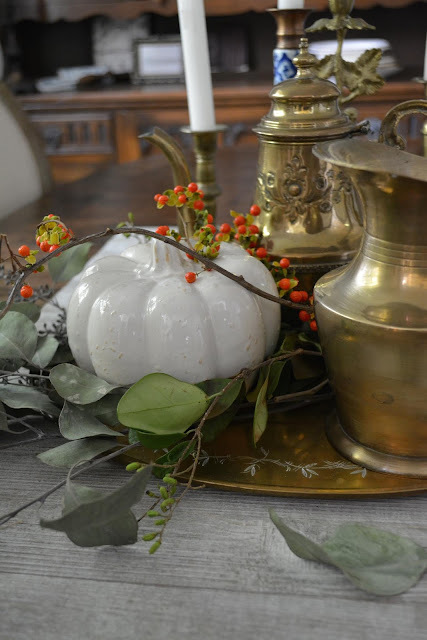 I've been putting out my fall decor which is so much fun. 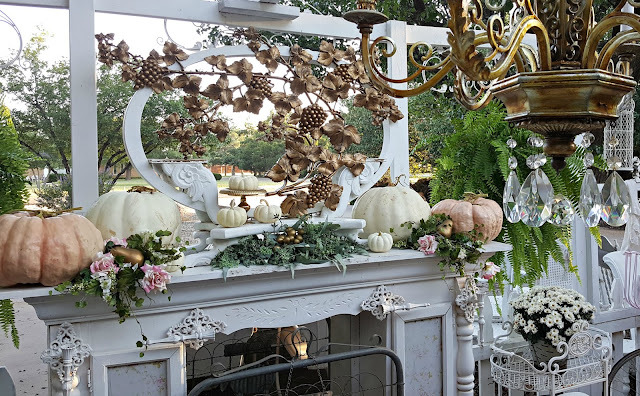 I'll be touring my fall decor on October 8th with some other fun Texas bloggers. 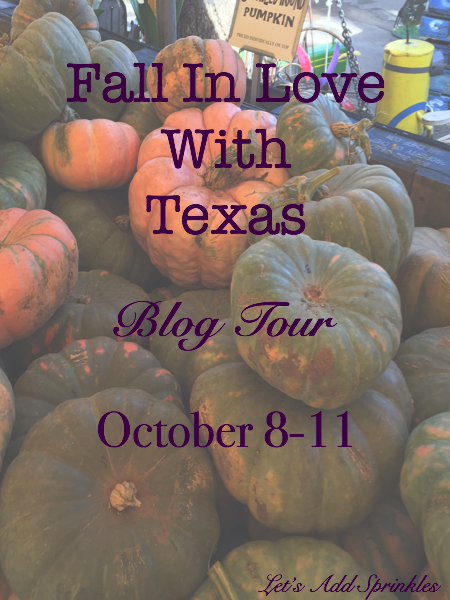 Please come back for this blog tour. You'll be inspired by all the Texas talent. This week I shared using bittersweet in my decor. 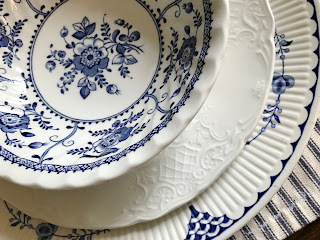 I also shared fun finds that I found while my brother and I were out junking. Bill helped me move my favorite armoire back into our room. When our bed and nightstands were brand new, I got it in my head that this needed to go into a guest room because the wood tones didn't match. I'm over that. I love it so much and I've missed it. It's the perfect scale for our room even though the color is a little off. 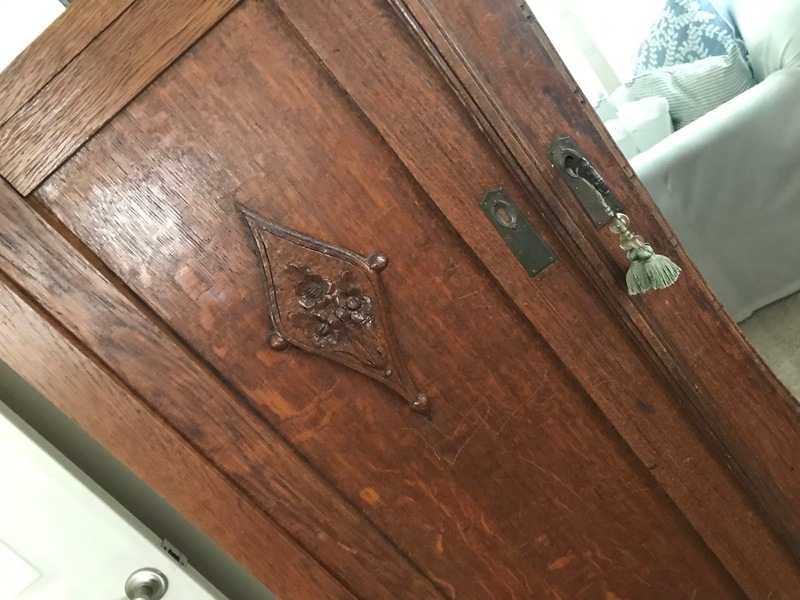 This our only antique that actually has the original key and the lock still works. Can you even? The details are amazing. I took photos today and I'll share more later in the week. We only paid about $200.00 for this at an auction. There are so many pretty details on this piece. I've wanted to move it for ages but Bill said he'd never move it again. The whole thing has to be taken apart to move it. I think the bonnet bashed him on the head last time. A big thanks to my husband for being willing to move it again. He didn't get bashed on the head this time. We did almost break the mirrored door though when it fell off. I cleaned out the pool and put all the pump hoses away. It was a mess after the last rain storm. I threw away the net because after 5 seasons it was worn out. I also threw out the pool noodles. It's always tempting to save them but they don't over winter well. I've cleaned off the deck and put the cushions back on. I added a little rust to the blue and white. I'll take pictures if it looks cute. I'm headed back to the doctor on Thursday. I continue to struggle with extreme pain on certain days. I've stretched and tried to strengthen my back and shoulder but there are days when I'm near tears in pain. What I'm doing isn't helping. That's whats going on with me. Our feature this week is Penny. I just adore her new patio space. She's decorated it for fall with those gorgeous heirloom pumpkins. Love bittersweet! I really enjoyed your junking post with your brother. You brought home some marvelous finds. Thanks for hosting and Happy Fall! Thanks so much for hosting and for taking the time to visit!! Thank you for hosting! I see why you'd want your armoire back in your room. I'd want to see it every morning too! Still in love with your pumpkin in the cage and may try to pull that off before I leave. Or not -- but it is spectacular! Love that armoire! Thanks for hosting, Katie! I just love your armoire, Katie. I am looking for another one for when I move. I think they are very versatile and can be used for a number of different purposes. Thank you for hosting. 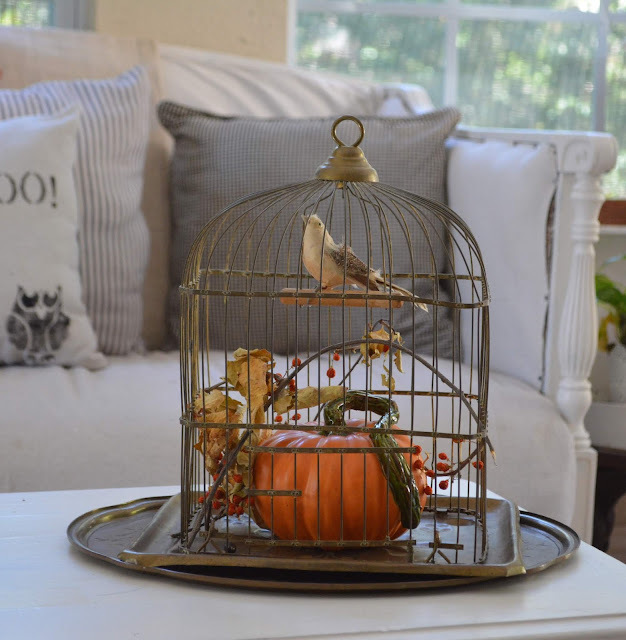 I love that little cage, it's so charming ! Thanks for the chance to hook up, Katie! Oh my word, I forgot to link up yesterday! I think all the work I've had done on my teeth is going to my brain!! Thank you for the party, Katie,and I see you've been busy. Your armoire is a beauty, and your Fall touches are so pretty.